The easy way to customise your own camo leads (and non-toxic weights). 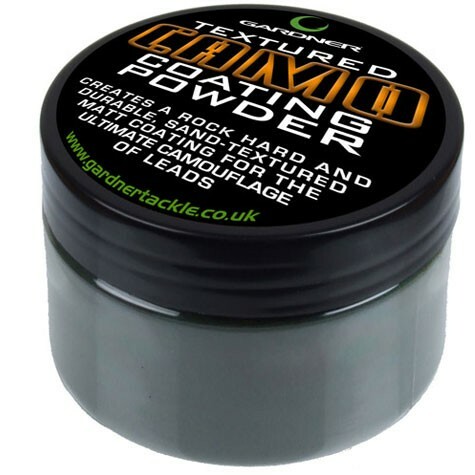 Creates a rock hard and durable, sand-textured matt coating for ultimate camouflage! 4 colours available: Green, Brown, Sand, Black/Silt or make your own unique colours by mixing any combination. Rock hard (when applied correctly) - the coating will not crumble off or decay in any way. Contains approx 100g (enough to coat up to 100 leads). Using a pair of pliers, heat the lead over a flame (eg. gas cooker) until hot enough for powder to melt onto it. Sprinkle a generous amount of the powder onto the lead until it is evenly covered. FREE Delivery on all Gardner Carp Leads over £100!! !